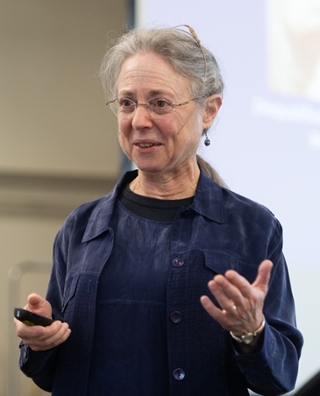 Guest speaker Susan W. Herring, PhD, professor of orthodontics and oral health sciences at the University of Washington School of Dentistry, offered engaging presentations on the topic of Craniofacial Growth and on Botox in Jaw Muscles. She explained what research has shown to be a benefit of botulinum toxin (Botox) injections and one of the potential side effects of the treatment, namely, bone loss. Following Herring’s presentation, an award was presented to the winner of the Student Table Clinic Competition. 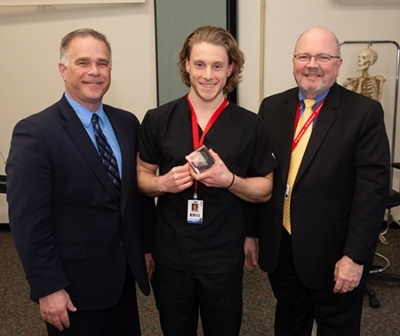 Joel Pluymert with Dentsply Sirona presented the first-place award to second-year student Hunter Watson, of Brighton. Watson’s research with faculty mentor Kevin Rowland, PhD, sought to expand the lab’s work on a pain model for dentistry. Dentsply Sirona’s sponsorship of the first-place award provides Watson the opportunity to present his work at the annual American Association for Dental Research (AADR) meeting in Washington, D.C. in March 2020. The ASDA People’s Choice Award and other student awards will be announced at the SDM Research Luncheon on Tuesday, April 30. 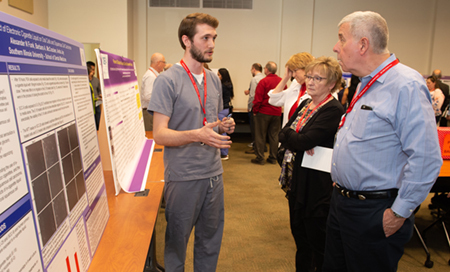 Other student research projects included topics such as salivary gland cancer, microleakage associated with composite restorations, and the effects of electronic cigarette liquid on oral cells and squamous cell carcinoma. Photos: SIU SDM Research Day guest speaker Susan W. Herring, PhD, professor of orthodontics and oral health sciences at the University of Washington School of Dentistry. (L-R) Dentsply Sirona’s Joel Pluymert presented a first-place award for the Student Table Clinic Competition to second-year student Hunter Watson. Standing with them is SIU SDM Dean Bruce Rotter, DMD. Second-year student Alex Funk describes his research involving electronic cigarettes during the Student Table Clinic Displays. 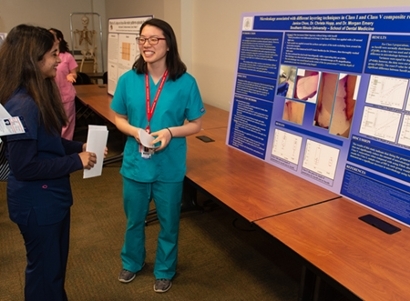 Second-year student Janice Choo presents her research project to a fellow student.